When I was planning this trip I saw a thread about Bulgaria in the HUBB and I asked about places to visit, since it was the country I had researched the least. Someone mentioned Doug’s Motocamp there, which sounded like a similar concept to the Biker Camp I had stayed in when I was in Budapest. I had really enjoyed that experience, so I as very keen to head into he country’s central mountains and see what it was about. Now, the Motocamp should have been the story of the day, it did turn out to be an amazing place, if it were not for something else completely unexpected that happened in the morning long before I set off. In fact, the story begins the night before. I was posting the blog’s articles and pictures on Facebook and I saw that I had a friend request from someone called Julian who lived in Sofia. As far as I could remember, we had not met anyone in the last few days, so I did not accept it and went on writing. The following morning, when I grabbed my phone from the bedside table to stop the alarm clock, I saw a notification from one of those annoying apps that come with the phone and that you can not uninstall. I was about to ignore it, but then I saw it was from the same guy who had sent the Facebook request, and I got curious to see who was so insistent to contact me. I opened the message and it read ‘Hello, I think I found your camera, I’m trying to contact you through your Facebook account’. I could not believe it. Still half asleep, I had to read it twice more before I frantically typed a reply. 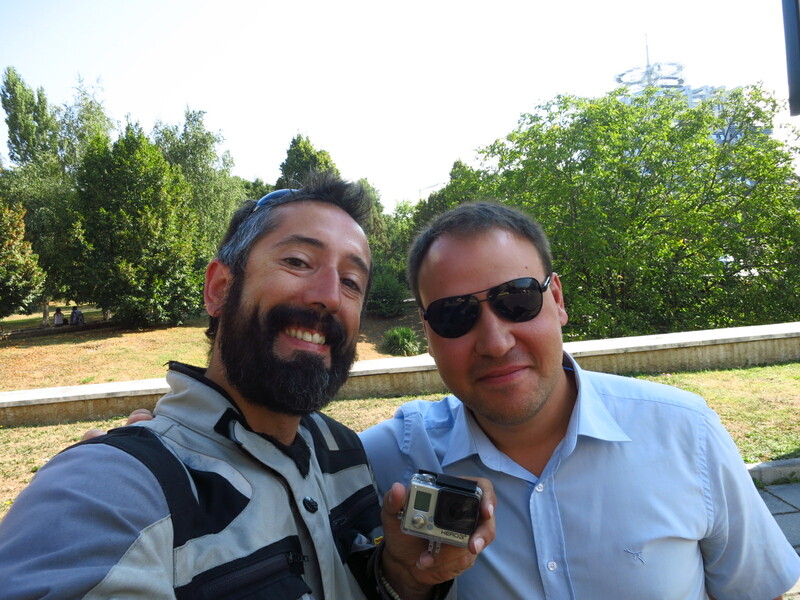 He asked me whether I was still in Bulgaria, and when I told him I was in Sofia, not in Bansko, he replied that he was also in the capital. He sent me an address and I saw that it was to the south of the centre, so I told him I could be there in an hour. I was still in my underpants, and so stunned that I did not even think of asking him how he had found me. I got dressed, went down to the cafeteria for a quick breakfast, loaded the bike, checked out and followed the GPS directions to his address. It was not until I was riding through the Monday morning rush hour traffic that I asked myself the question – there were no contact details on the camera itself, and the pictures and videos it contained did not mention my name at any point. Maybe the bike license plate? But how can you get someone’s name in Bulgaria using a foreign vehicle number plate? I was mystified. When I got to the rendezvous point he was already waiting for me, and sure enough, he had my camera. I was so happy to have the pictures and videos back that I immediately launched into an endless profusion of gratitude, and once again, it took me a while to ask him the million dollar question – how did he find me? By an incredible succession of lucky events and sheer investigative talent, that’s how. 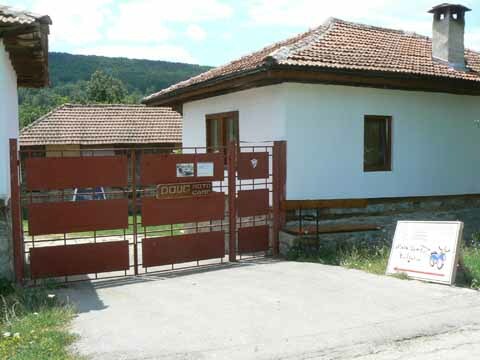 He said that he had thought of leaving the camera in Vihren hut, but then he thought that whomever had lost it may already be gone from there, so he left a note with his contact number and took the camera with him to Sofia. Then he looked at the pictures to see if there was something that could help him identify the owner. Going through them, he saw that I had a badge on my riding jacket that says ‘Rider1000’, and thought that it might be some kind of club, so he googled it and found its website. 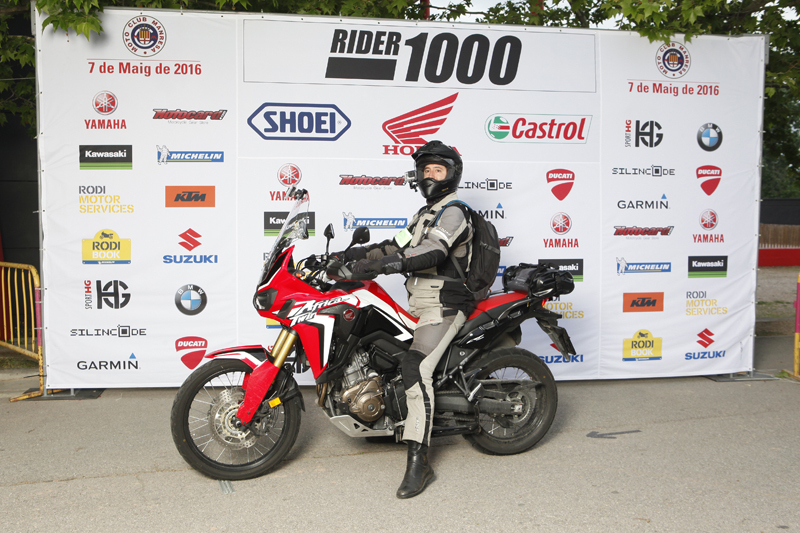 As you may know if you follow this blog, the Rider1000 is an endurance riding event that consists of riding 1000km around Catalonia, and as luck would have it, the list of last edition participants was still posted on their website. But wait a moment, you might think, he did not know your name, so how could he find you in the list? Good question. 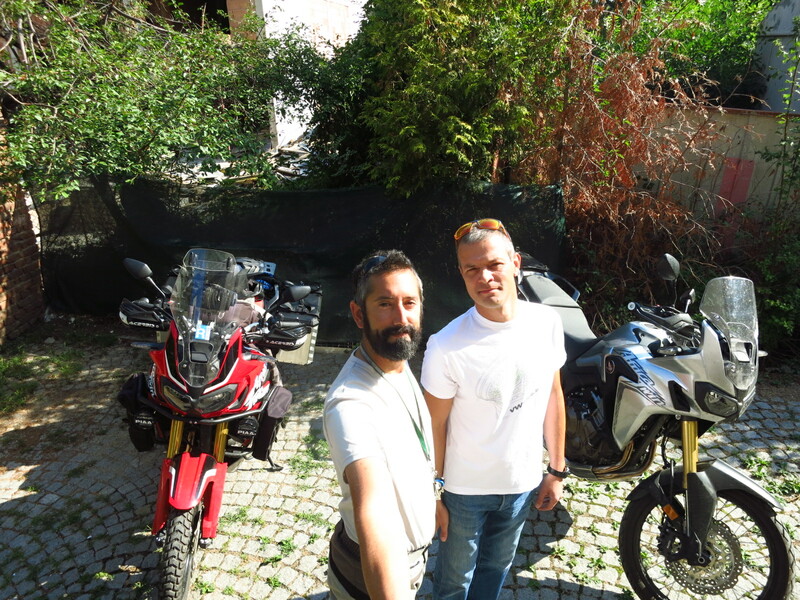 He had also seen my motorbike in the pictures, and he knew it was the new Africa Twin. On the Rider1000 participants list they post the name of the rider and the make and model of the bike, but not the license plate or any other information, so I was very lucky not only to have had my camera picked up by someone who knew enough about bikes to identify the make and model of mine, but to have that particular type of bike. 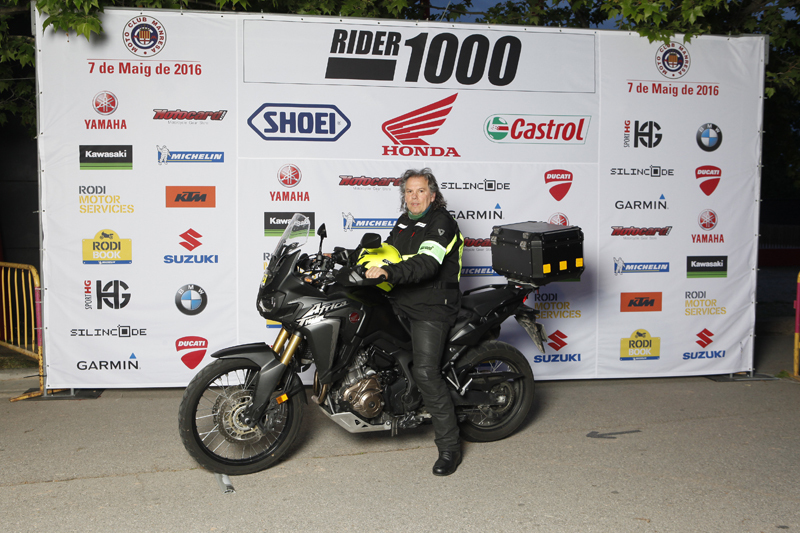 You see, there were 850 people on that list, and only two had entered the event with a new Africa Twin. Thank God I hadn’t bought a GS! So now he had two names, and in the same website you can find the picture that is taken before the start line, with each rider on his bike in front of a sponsor board. He looked both names up and then identified me from the pictures in the GoPro. Voilà, he had my name. After that he only had to search on Facebook and he was able to contact me. He had to go, so we did not have much of a chance to talk more, but he restored my faith in humanity for a good time to come. But that’s not the end of the adventures of owning an AT … after he left I stayed where we had met to send a message to Nat, who was thrilled to hear the news and could not quite believe it, particularly getting such a story on a super condensed version through WhatsApp. I was sitting on the bike by the side of the road on a big avenue, with the warning lights on, fumbling with my phone, when a guy on a scooter stopped by and asked me if everything was OK. It turned out that he also had a new Africa Twin, we got talking and he told me that he lived just round the corner and invited me to see it. In the nth coincidence of the morning, when I mentioned that I was going to the Motocamp in Idilevo he told me that he had just been there the day before, he was friends with the people who run it, and he got a map out and recommended the best roads to get there avoiding main routes. Unbelievable. And it was not even 11 in the morning. 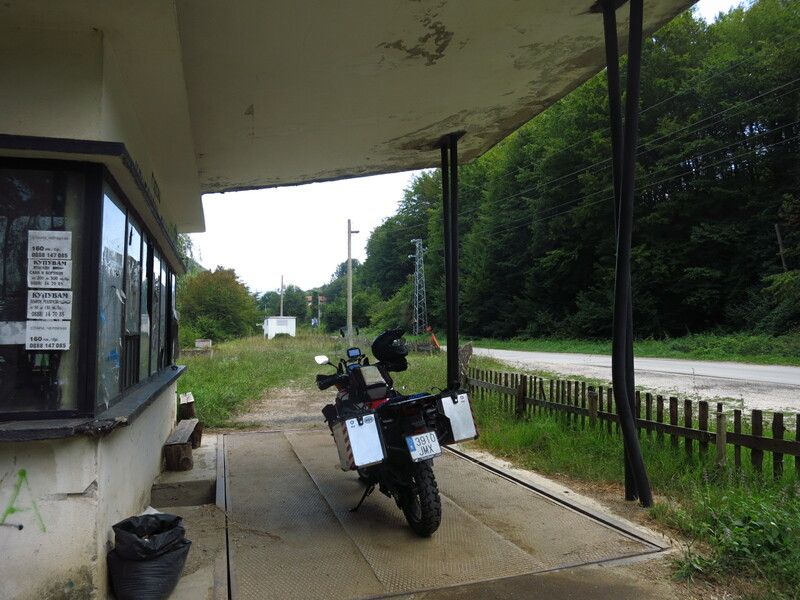 After exchanging contacts I left Sofia following Nikolay’s directions, and I had a great time on the small roads through the Central Balkan mountains, travelling through small villages, forests… all on my own, no traffic to bother me at all. I saw an abandoned truck scale by the side of the road, and next to it, a couple of tables, a barbecue and a small shrine with a fountain, all by the river, so I thought it was a good spot for lunch. 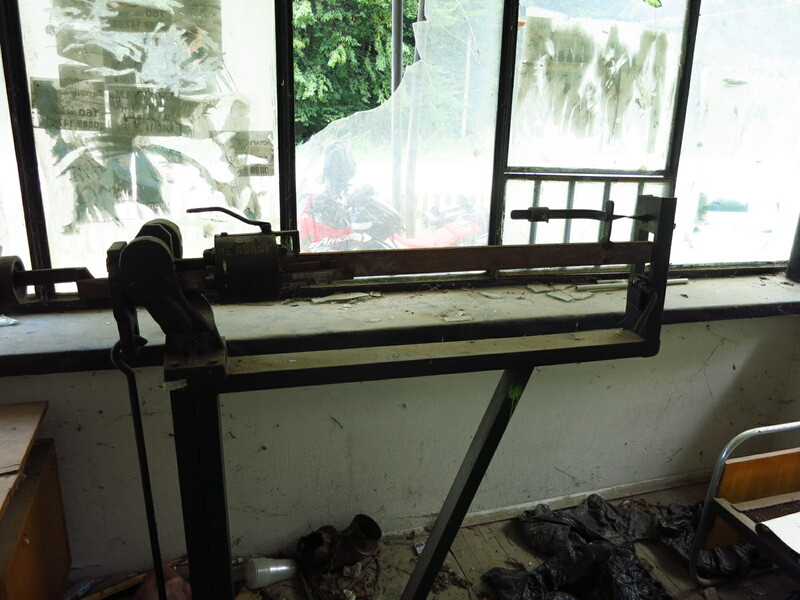 When I parked the bike on the scale platform I saw through the broken windows that the scale was still there, unlike most of these devices when they have been left unused, and the door was open. It was early afternoon by the time I reached the village of Idilevo. A few km off the main road, it was a tiny village, I was out the other end almost before I realised I had arrived, and right before the end of it, I saw an old motorbike with a Union Jack painted on it, and on the opposite side of the road, a gate with a carved wooden sign that read ‘Doug Motocamp’. I stopped in front of the gate and Polly came out to receive me. She was the only one there, she told me, the other two owners, Doug and Ivo were away. She showed me around the place, there were four rooms for guests (Yamaha, Honda, BMW and Harley), I got the Yamaha one, since the Honda was already taken. 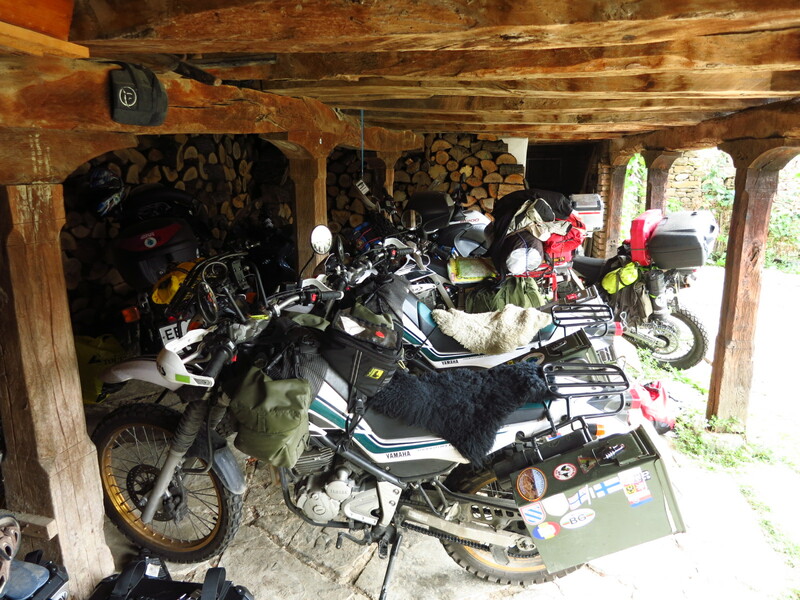 There was also a common room/bar in a barn, a barbecue area and a workshop with tools and space to store motorbikes. I had a shower and sat down at one of the tables next to the barbecue to write a bit when other people started arriving. There was going to be a barbecue that night and Polly had invited me to join in. Before I realised, there were more people there than could possibly fit in the four guest rooms, and the beer from the help-yourself-fridge did not help me remember all the names I had been told in a matter of minutes. Talking to different people, I realised that most of them were not guests, but travellers whose paths had taken them to this little village in the middle of Bulgaria at some point in their lives and they had realised that it was the perfect base both for exploring this part of the world (Greece, Turkey, Macedonia, Albania, Montenegro, Kosovo, Romania, etc. are all very near) and as a starting point for longer trips east. Some of them had left a bike here and flew from Germany or the UK (where most of them were from) to spend the summer riding here instead of wasting a week coming and another going back home, others had even bought an old house in the village and were doing it up, since both the price of property and labour were incredibly cheap. This entry was posted in Balkan Adventure 2016, Travel and tagged Bulgaria, GoPro, Honda CRF 1000L, Idilevo, Motocamp, Sofia by Kilian. Bookmark the permalink.